From the fluffy Cumulus that form on a sunny day, to the rare Noctilucent clouds that shine from the fringes of space, the fleeting beauty and endless variety of clouds have always fascinated scientists and daydreamers alike. Introducing 40 uniquely different cloud species and light phenomena with hundreds of spectacular photographs and extensive descriptions, CloudSpotter enables you to easily identify and spot them in the sky. Become a CloudSpotter, build your collection, unlock Stars and Achievements as you join the global community and compete with other CloudSpotters around the globe! An astounding, eye-opening experience for sky lovers and cloud novices of any age, created by Gavin Pretor-Pinney and The Cloud Appreciation Society. By using CloudSpotter, you will help scientists better understand and model climate change. We are excited that NASA will use the data gathered by CloudSpotters around the globe to calibrate their CERES cloud-observing satellite instruments. The Cloud Library features 40 unique cloud formations and optical effects, from the common Rainbow to the rare and beautiful Asperatus cloud, with hundreds of stunning photographs. All featured varieties and effects include Gavin Pretor-Pinney's extensive and entertaining explanatory notes from the bestselling Cloud Collector's Handbook. Use CloudSpotter to identify and photograph the clouds and light effects you spot in the sky, and our special team of cloud experts will confirm whether you have got them right! Not sure about the kind of cloud or optical effect? The unique Cloud Identifier makes figuring out what exactly you are spotting a breeze! Just answer a few simple questions, and CloudSpotter will tell you what cloud type or light effect you are most likely looking at. 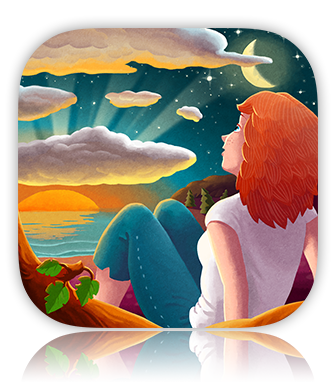 Collect clouds, unlock Stars and Achievements and compete against CloudSpotters worldwide! You collect Stars for each cloud type you spot. The rarer the cloud, the more Stars you earn. Complete special challenges to earn 20 beautiful, hand-drawn CloudSpotter Achievement Badges. See how well you fare against the growing worldwide community of cloud lovers on the app's CloudSpotter Rankings. Browse the CloudStream, a live feed of photographs by other CloudSpotters around the globe. • TUAW features CloudSpotter as the "Daily iPhone App"
• Blackle Mag about CloudSpotter and "crowdsourcing a cloud atlas"
Creator of the CloudSpotter app, winner of the Royal Society Winton Prize for Science Books and founder of The Cloud Appreciation Society, Gavin has just given a talk on cloudspotting at TEDGlobal June 2013. Crowdsourced data collected by CloudSpotters around the globe contributes to the research of the entirely new cloud type classification Undulatus asperatus. "Now I can say I've contributed to NASA"
"The interface is smooth and easy to navigate, the photos are clear, the descriptions detailed and the return speedy. Within seconds the app was able to tell me that the small cloud I captured belonged to the cumulus family. The best part was seeing photos of clouds snapped by other users." "I'm going to be addicted!" "It's great! Experts on hands to verify your cloud ID, stylish animations and explanations, and collectors badges to earn. Just not sure how I'm going to tear the kids from it for long enough for me to use it myself." "I can strongly recommend the app. CloudSpotter does a great service by letting clouds have their day in the sun. It should prove a fun, challenging, and educational app for newbies and experienced cloud spotters alike, and it lets you contribute to useful research as well." "Genuinely interesting and good fun!" "What stands out in this app is the interactivity and the gentle way it encourages you to learn. It makes you stare into the sky and think about what you are seeing. And as you start to understand what each cloud in the sky is, you start to appreciate them more." With 40 fascinating, unique varieties and hundreds of gorgeous photographs, CloudSpotter is a perfect sky-gazing companion for long walks, cross-country road trips or train rides, and above the clouds from the window seat of a plane, where you might even spot the elusive Glory optical effect; a beautiful halo of rainbow colors around your plane's shadow. Collect all featured cloud formations and complete your CloudSpotter collection with 115 Stars to clear the legendary "Triumph in the Skies" Achievement. Who will be the first person in the world to perform this extraordinary feat?